Thomas Campbell’s “The Dirge of Wallace” appears in the eighty-sixth installment of The Chartist Circular, circulated on May 15th, 1841. It commemorates the death of Sir William Wallace, a Scottish landowner who fought in the Wars of Scottish Independence, battles between the Kingdoms of England and Scotland that occurred in the thirteen and fourteenth centuries. Thomas Campbell (July 27th, 1777 – June 15th, 1844) was a lyric poet and writer of war songs. The youngest of eleven family members, he was born into relative prosperity but later suffered financial loss when his uncle-in-law Daniel Campbell’s tobacco business failed and almost ruined Thomas Campbell’s father, Alexander Campbell. He was known for writing poems such as “The Pleasures of Hope” and songs such as “Ye Mariners of England,” “Hohenlinden,” and “The Soldier’s Dream.” The Chartist Circular, in which “The Dirge of Wallace” appeared, began weekly circulation on September 28th, 1839, ending on vol. 2 no. 146 on July 9th, 1842, and was meant to popularize the cause of Chartism, a movement for equal participation among rich and poor in the system of democracy. The periodical was issued in Glasgow, Scotland by the Universal Suffrage Central Committee for Scotland after a “great national delegate meeting,” in the Universalist Church, Glasgow, on August 15th, 1839, a meeting with the aim of creating a system of political advocacy and organization (Waterloo). A highly political, liberal publication that seeks, as William Thomson writes in the preface to the collected volume, to “induce the people, by imbuing their minds with . . . knowledge, to concentrate their energies in the acquisition of their liberty” (iv), The Chartist Circular nonetheless includes here a poem about a non-contemporary figure, historical but not directly related to the current efforts to democratize the vote. Yet, as a liberatory figure associated (in this poem, at least) with patriotism and military courage, William Wallace provides The Chartist Circular with a hero who both satisfies its aims of promoting the liberation of oppressed people and discourages perceptions of subversion and disloyalty to country on the part of the editors. In keeping with the periodical’s narrative of little-known information being distributed widely to those who might not normally have access to it, Campbell writes, “Yet knew not his country that ominous hour” (19) and “The bugle ne’er sang to a braver knight” (39). Now, however, The Chartist Circular reveals such information, even excavates it, as “His head unentombed shall with glory be palmed” (44); his corpse shall be exhumed, for the edification of all. 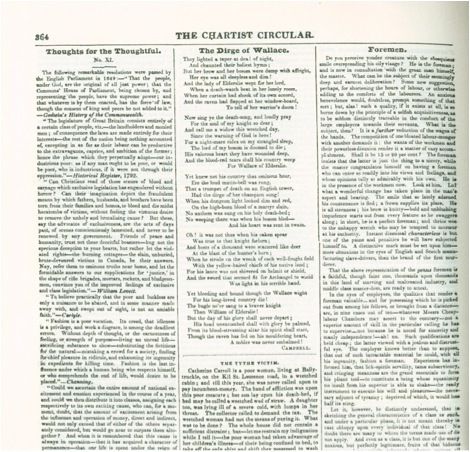 Though less overtly political than many of The Chartist Circular’s other poems, therefore, which often presented complaints about debt, labour, and the upper classes, “The Dirge of Wallace” does the subtler work of aligning the periodical with the interests of the country. Of course, as a Scottish publication, The Chartist Circular also celebrates a national hero, who led his country in battle against English oppression. Ironically, the story of William Wallace, promulgated by the poet Blind Harry, may be more mythic than factual. In “The Most Efficacious Patriot: The Heritage of William Wallace in Nineteenth-Century Scotland,” Graeme Morton argues that, despite there being few documentary sources to support their claims, political activists in the nineteenth-century effectively created the popular account of William Wallace, and that, “During the age of nationalism, William Wallace secured his position as Scotland’s most efficacious patriot, fulfilling the agenda of friends and foes of the Union” (251). Hence, Wallace took the form of a subtle but effective propaganda tool, rather than a figure of education or strict history. A lyric poem, “The Dirge of Wallace” has an ababcdccd rhyme scheme, a mostly regular metre in pentameter, and five stanzas consisting of nine lines each. Its regular, song-like structure belies its political utility. The ending lines of each stanza, consisting of brief, largely emotional exclamations or statements, exemplify the deceptively simple, hero-mourning tone of the poem, as well as conceal the lines that align the supposedly little-known story of Wallace with The Chartist Circular’s mission of education and political advocacy. Beattie, William. Life and Letters of Thomas Campbell (Volume 2). Online library.eBooksRead.com, 2007. New York: Harper and Brothers, 1848. Web. 17 October 2013. <http://www.ebooksread.com/&gt;. Morton, Graeme. “The Most Efficacious Patriot: The Heritage of William Wallace in Nineteenth-Century Scotland.” Scottish Historical Review 77.2.204 (1998): 224-251. Academic Search Complete. Web. 16 October 2013. Thomson, William. The Chartist Circular. v. 1-2. Glasgow: W. & W. Miller, 1841-42. Print.